Hands-on classroom training, enabling Petroleum Technology students at West Virginia Northern Community College to learn skills that will help them be better workers in the field, has been provided by a Pittsburgh firm specializing in fluid-system products and strategic services. 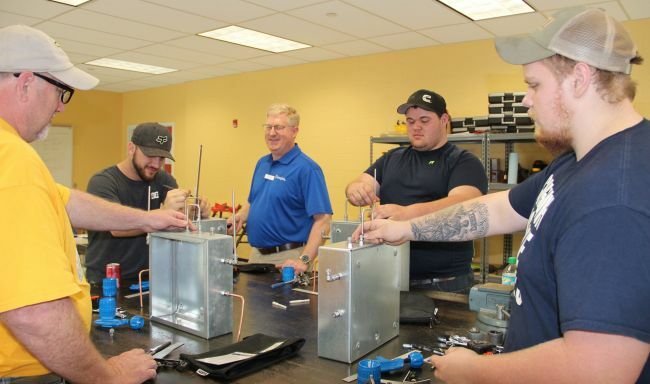 Late last month, Mike Gagel, Pittsburgh Valve & Fitting Company’s technical trainer, gave the students a class on Swagelok Tube Bending and Fitting Installation, according to Curt Hippensteel, petroleum technology instructional specialist at Northern. The class provided students with information and hands-on experience in tube bending and fluid-system installation best practices. During the training, Gagel taught students how to use Swagelok tube benders, cutters, deburring tools and fittings to fabricate and properly install a variety of tubing configurations.